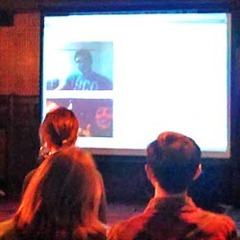 Anyway, someone’s done a Chatroulette party I am delighted to say, in New York of course. All it takes is a hall with a seating area and a good projector. Oh and a hostess too. Okay it is a bit weird, but no weirder than fox hunting and people do that for pleasure. Apparently the C’roulette partners get a bit freaked out by suddenly facing a room full of people. But some of them really like it and start acting up something major. Okay, so who wants to organise one of these in England?